April | 2015 | Je Me Souviens-To Infinity & Beyond! Je Me Souviens-To Infinity & Beyond! 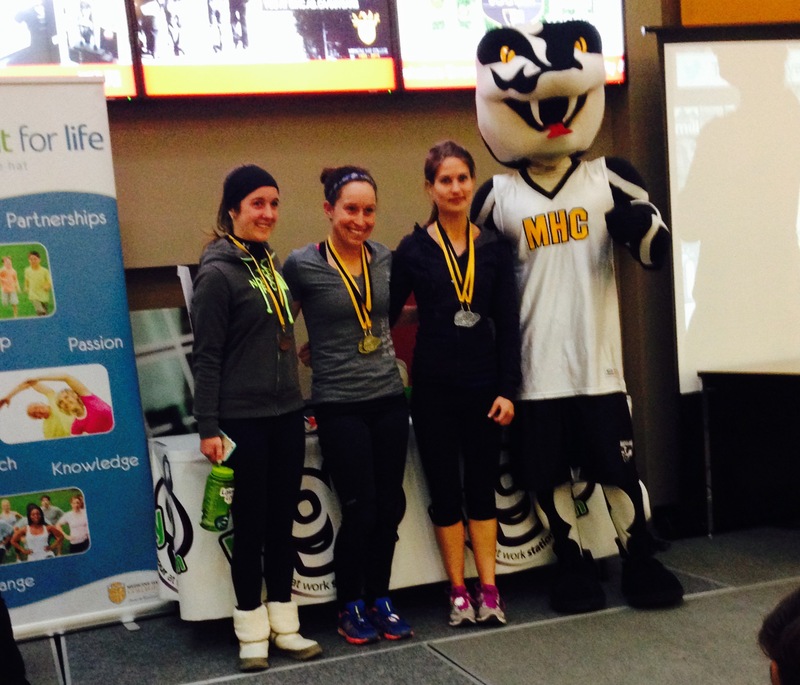 On Saturday, April 25th, 2015, I participated in the Medicine Hat College Rattler Run 10km. This is the second time I have ran this event, the first being in 2013. Back in 2013, I set a personal best of 48:39. I remember being so elated at that moment of setting this time, and being able to place 1st in my division. 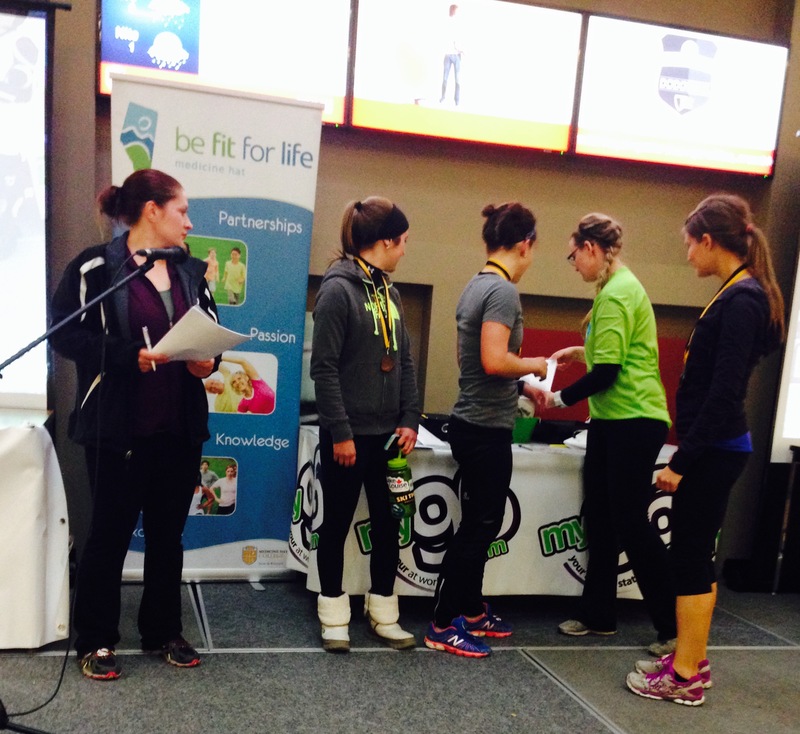 Since then, I have been able to bring my 10 km time down to a 43:47 at the Moonlight Run in Lethbridge this past March. 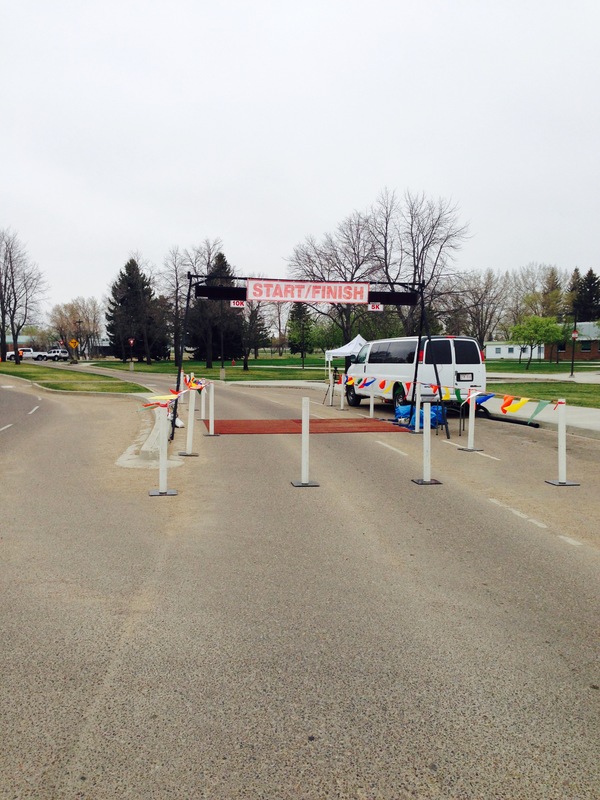 I was anxious to run this race in Medicine Hat, as I was familiar with the course, and hoping for another personal best. This day also held importance to me going into the race as the 11th anniversary of my dad’s passing. When I registered for the event a few weeks prior, I knew it was fitting to be running a race on this day. I would have him in my mind all day and be running this race in memory of him. I stated on my Facebook page the day prior to the event how the event’s motto is “I Run for Me” and to promote healthy and active lifestyles for everyone. My dad lived a healthy and active lifestyle and was a fitness role model for myself, and while I would be running this race for ME, I was more so going to be running this race for HIM. Medicine Hat is about 1 hour and 45 minutes away from where I live in Lethbridge. I have driven this distance before for races, usually to Calgary though, but the unique thing about this race is that the start time is 11 am. I could sleep ‘in’ to a normal time, and still do the drive and make it to race packet pickup and warmup with plenty of time to spare. I made it to Medicine Hat College at around 10 am. Packet pickup was a breeze and it was of course great to see Randy and the crew from Racepro working the timing! I also had enough time to do a good warmup, so I headed out for a 2 mile warmup at an 8:34 average pace. We were off and I headed out with the mindset of trying to get a 6:45-6:50 pace per mile. With my interval running I had been doing lately, I knew this was possible….if I was on flat surfaces, with no hills and no wind. 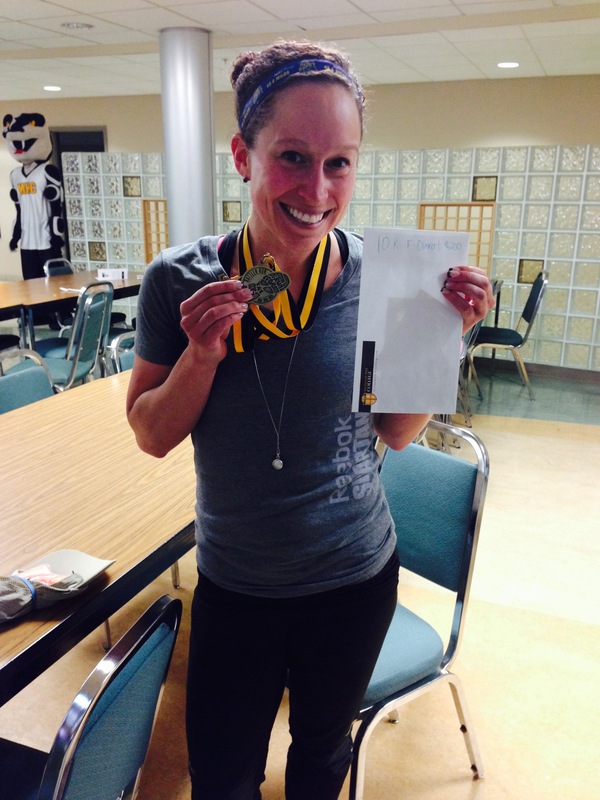 I held a 1st place female position for the first mile, which took us over an overpass and onto the trail system. The trail system is VERY curvy and lots of ups and downs! The “Ups” were never that steep, and the “Downs” weren’t either, but there was enough of them to really get you! At mile 1, a female runner passed me. OK, I thought….since I was not in Lethbridge, I did not know who this runner was, so I really had no idea what she was capable of. I kept her in my sight for the next mile and I was able to overtake her by the end of mile 2. I kept telling myself to never look back, and to only wait until the turnaround to see how close she really was. I could hear her breathing pattern initially, and then when I couldn’t hear her breathing I knew I was far enough ahead, for now. I just would keep on trucking. I ran mile 1 in 6:34 and mile 2 in 7:08. I did not like that 7:08. The turnaround was near mile 2.5 and I was still in the lead. 2nd place female was not far behind, but there was a pretty good gap between me and three. Since this next portion was just heading back on the same route, I knew what was coming ahead. It was motivating running towards other runners and seeing people I recognized from Lethbridge races. I ran miles 3 and 4 in 7:01 and 6:52. By this time, we were back to the overpass, and instead of heading back where we started, we looped around the backside of the college. This was a very sparse area of the course, with no spectators and no other runners heading past you in the opposite direction. I knew I just needed to keep pace. There was an aboriginal gentleman who I was running behind the whole race who I caught up to, and stayed about a few steps ahead. His cadence was the same as mine, so I decided to keep with him. The crazy thing about this man, though, was he was running the event in SANDALS! Very thin sandals with a strap around the heel and then through the toes. I don’t know if he normally trains barefoot, or just always with sandals, but it was a sight to see! I was able to keep pace for mile 5 and then I knew I wanted to kick it in for the last mile. We were heading towards people finishing the 5 km and would be hooking up with them for the final straightaway. 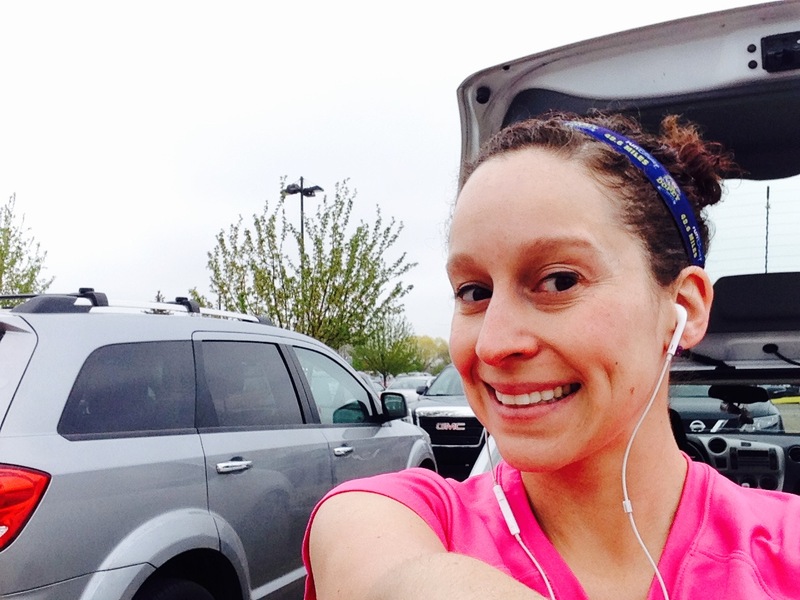 Seeing more runners ahead motivated me and I was able to push hard for that last mile. I also never looked behind me to see where that 2nd place female was, which I will never know if that was a good thing or a bad thing….but it doesn’t really matter….because I finished ahead of her in a time of 41:30! My final two miles had been 7:03 and 6:45….it was just what I needed! I stopped shortly after the finish line and was shaking, grabbing my quads….I turned around and saw female #2 finish right after me. She was right on my tail! Turns out, my chip time only beat hers by 9 seconds! Gun time was only 12 seconds! I thought she was farther back, but apparently not. I had won the female division in the 10 km—-a first for me! I was so excited about this win but I knew I needed to keep moving so I didn’t tighten up. I ran a 2 mile cool down at an 8:55 average pace to total my mileage to 10 miles that day. Heading back in to the college, a nice spread of post-race refreshments were set up. I immediately zeroed in on the chocolate milk and bananas! I had brought clothes to change in to, as I didn’t want to be sitting in disgusting race clothes during awards and more importantly, my drive back to Lethbridge. They held the awards in the College cafeteria, which was a great setting for the 10 km awards (which were last) but it seemed a bit crowded for the 3 km and 5 km awards, as there were a TON of young kids there and their families. It emptied out quite a bit for the 10 km awards, which made it nice for us runners, as before it was too hard to hear or see what was going on. I sat with the Lethbridge contingency of us who were out at the race, which was nice since a few of us were called up for awards….so we had a cheering section! I first went up when they called for the 26-35 age group for women (I know, weird age groupings!) and then again at the end when they announced overall in each gender. This was my “Olympian” moment I guess, as I have never earned a 1st female overall in such a large event…I think this is my third 1st female overall ever, with the last two being from smaller 5 km races. I am also really proud that my time was a personal best….not just by a little, but by a lot. So I know personally I worked as hard as I could! If I had been able to get 1st overall with a time slower than my personal best, I wouldn’t have honestly have been as proud. Another sweet thing was the prize money—-$200!!! That cash is coming with me this weekend when I fly to Vancouver for my main event! Would I do this event again? YES. It is extremely well organized and well worth the commute to Medicine Hat. If you are looking for a competitive 10 km, this seems to be a good one, for both the male and female divisions. This is also a unique event in that the whole family really can participate….if one parent wants to do the 10km, an older kid do the 5 km, and the other parent and small child do the 3 km, that would totally work. The registration was also very reasonable. The early bird pricing for race registration was $20 for race registration, and the late registration (after April 7th) was $30. You could also pay with cash day of for $40. This was the same price for ALL RACE DISTANCES! This did not include a shirt, however-a shirt would have cost an additional $15. The Rattler Run was in its 35th year, and I totalled the finishers in the 10km, 5km, and 3 km by looking at the Racepro.ca website- there were 754 participants. This race reminds me much of Lethbridge’s own “Moonlight Run” in that it is a “tradition.” Albeit, smaller in scale, but still recognized in the community, appreciated, and thriving. This was a great event for myself, not just because of my personal accomplishment, but because of the significance that the date April 25th holds. That date does not need to be a sad day; it needs to be celebrated. And I am more than grateful that I could celebrate by doing something my dad would have been proud to watch me do. This past weekend I participated in a local 5km race, the Coaldale Family Fun Run. It is the fifth year of this event being run, and my second year in a row participating. Originally, I was planning on running most of my Saturday workout before e event, and then ending with the 5km. I had a 14 mile long run to do, with the last 6 at my goal pace for my marathon, or faster. As it got closer to the day of the event, I knew I didn’t want to be trying to race a 5km after already doing 11 miles. So, I decided to reorder my workout, still get the 14 miles in, but do it in reverse. I would do a warmup and cool down at marathon race pace in Coaldale, push as much as I could during the race, and then finish the workout when back in Lethbridge. My last timed 5km race had been in November, and I wanted to see if I could beat that personal best. I ran the Mustache Dache in a 21:07 back in Milwaukee, which broke my 5km personal best that I had held since I was 18. Now, I don’t train for racing in 5km races,but I know that I have been doing more speed work than ever this winter and spring as I train for the Vancouver Marathon. So it would have to count for something? The race was slated to start at 10am. I arrived at around 9:20, which gave me more than enough time to pick up my race bib, do a 1.75 mile warmup, and meet up with four of my Waterton to Glacier buddies-Julia, Emma, Danny and Ryan. I even snapped this photo of Julia, Emma and Ryan doing their warmup down the rural road we would be heading down during the last mile of the race. This shows the terrain and road conditions we would face for about 85% of the course. I got lined up with a few minutes to spare. My race plan-push hard the first mile and hold on. I really had no other strategy. The temperature was ideal, so I knew I would be comfortable. I was a bit worried about the muddy mix of gravel and sand and dirt we would be running on, as I remembered from last year that my feet feeling like sandbags. The race began and a bunch of us plowed over the kids who were lined up in front. Ok, I know it is a Family Fun Run, but I mean, I was out to make a statement….so I didn’t feel bad dodging through children. I found myself in a comfortable position right away, and I knew I was the lead female. I wasn’t going to look over my shoulder at all during the race, and just wait until the turnaround point near mile two. At that point I’d be able to see how close any other women were and tackle the last mile. My first mile was a fast 6:13. I was feeling good though, and it wasn’t too muddy. I needed to weave a bit on the rural Range Road to find the least mucky spots, but it helped with my shoes not getting full of junk. Mile two was slower (I knew it would be because I wasn’t trying to necessarily get even splits) with a 6:36. This was past the turnaround and up a slight hill. It was also straight into the wind. I started feeling sluggish here, and I saw the second female probably 30-45 seconds behind me. If I bonked on the last mile she would catch me. The last mile was a solid straightaway to Coaldale Christian School. It was wet on this portion and I made a mistake of stepping in a pile of mud and gravel, so for a few seconds I had rocks and mud flying from under my shoes. I was able to hold my position and finish as the first female! I finished my last mile in 6:57, and finished the race in a 20:42! I beat my previous personal best by 25 seconds! I did a cool down and milled around until awards, which were held in the gym. The race organizers did a great job at having lots of post race refreshments—-more than I would expect for a 5km! They do a great job at recognizing the kids who participated, as each kid gets a finisher ribbon, and they do 5 year age group awards for under 19. So lots of kids get recognized this way. They even gave a prize to the youngest runner—I think it was a Toys R Us gift card. I know I would have been stoked about that if I was a kid! They got to the adult awards and each of us in our Waterton to Glacier group medalled! Ryan got 3rd overall and 2nd in his age group, Danny got 1st in his age group, and Julia & Emma earned 3rd and 1st in theirs, respectively. Along with my gold medal for 1st in the 30-39 female category, I was also awarded a $50 gift certificate to Runners Soul! I was really excited to be able to run this race at the pace that I did. I even was able to do the rest of my workout later that day all within my training pace required, so I did total 14 miles! While 5km races aren’t my focus, they are still fun to do every once in a while! I know the next one I do I will be aiming for a 20:30 or faster. I know my training has helped lots, as this was not only a personal best, but I beat my time from last years’ event by over two minutes. Last year, I ran a 22:59. Seeing that improvement is what is most important to me. Up next is a 10km in Medicine Hat (Saturday) and then the big one….Vancouver Marathon is now just two weeks away…. Three weeks to go until the BMO Vancouver Marathon! My last few weeks have gone well, but I knew I had some crucial training runs coming up that needed to go well, as to boost my confidence. Also, take into account I went home last week to Milwaukee, Wisconsin, and this has historically led to me sluffing off on training. I only skipled (whoops) one day on my plan, so I am pretty proud. I had slept in too late before a friend picked me up for the morning, afternoon and evening of activities, and by the time I got back home I was wiped. What crazy activities did we do? Well, went and got my bridesmaid dress for her wedding fit, and then we went to Potawatomi Casino downtown to play bingo for three hours. We used to do this back when we weren’t yet 21, as 18 year olds can access the bingo hall at the casino, just not the casino floor. I think the best part of it was just laughing at all the crazies around. Best person we saw was a lady on the smoking side (glass wall separation) walking around with a surgical mask covering her face. Other Milwaukee-Related activities I partook in was watching the Badgers NCAA Final basketball game at the bar I used to work at. They lost. Then my mom, cousin and her husband went to Miller Park to watch the Brewers second game of the season. They lost too. But all was a lot of fun! One of my last nights my mom and I spent a day and night in Milwaukee doing the Lakefront Brewery Tour, eating at some awesome local places, shopping, and then painting at Splash Studio. Now, I didn’t just eat, drink and watch sports. I did run. I really did! I even found one trail in the Franklin Woods that I honestly had never ran on before in my life. It was super pretty! It was also actually a lot of fun to do my runs back on the bike trail near my moms house. It is really an awesome trail. For the training runs that I did it worked quite well. My best run was on Thursday morning when I did 5 miles at my Tempo Run pace. I needed to be between 6:54-7:10 minutes per mile. I was thinking “how the hell am I going to do this solo?” I was going to get up real early to do this run but there had been thunder lightning, hail, rain, downpours, everything all night. It was still raining pretty heavy. I checked the radar and ther was going to be about an hour or so window at around 8:45 with no thunderstorms so I waited and headed out then.While it started thundering in the distance at mile 4, there was no lightning (just a steady rain), but this caused the trail to be empty! You never see this trail empty. Anyway, I head out unsure what I would be able to do, but I made it back home doing better than I could have ever hoped for! I did my 5 miles in 35:18, with each mile being 6:52, 7:03, 7:19 (you can see this as the out and back point on the map where I had to do a turnaround), 7:03 and 7:01. I felt like a million bucks when I got home! So the running in Milwaukee went well, but I wasn’t home free yet, what I was nervously awaiting in my Lethbridge home was my 20 miler run to do on Sunday. After a week of making poor food and drink choices not conducive to a good training plans, and after a day of traveling….I needed to muster out 20 miles at a pace between 7:48-9:04 per mile. The weather was quite windy, but the temperature was ideal. I headed out optimistic and knew I wanted to push myself. The route Runners Soul had planned for our club run today was awesome. Only one big hill and the wind was fortunately at our back heading up it, Running down the hill into softball valley first was more challenging, as it was the slowest downhill I have ever run! Wind was pushing your body backward almost, and the water treatment plant sewage was wafting right in your face. I managed to complete my 20 miles in 2:42:42 with an average pace of 8:08 an mile! I am training for an 8:00 minute mile, so I am right where I need to be! My fastest two miles were actually mile 3 and mile 20, each at a 7:48 and 7:49, respectively. My slowest were mile 8 and 11, where I had an 8:29 (wind!) and 8:30 (hill!). Being able to hold it together strong the latter half of this training run was my big concern, so the fact that I could makes me so excited for Vancouver….just three short weeks away!